Megan EliasAfter three years of hard work, and of making the most of the opportunities available to her, a Bangor University student proudly graduates this week. A former pupil of Eirias High School, Colwyn Bay, Megan Elias, from Old Colwyn, was brought up in a non-Welsh speaking family, and three years ago she intended to go to study for a degree in finance at an university in England. However, three days after she left school, on a visit to the Urdd National Eisteddfod in Bala, she was overcome by a feeling that she wanted to speak Welsh and immerse herself in the culture. 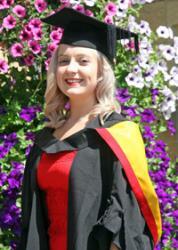 She changed her mind and became an undergraduate student at Bangor University’s School of Welsh in September 2014. From the moment she arrived at the School of Welsh, Megan embraced student life. She is an excellent example of student from a second language background that has managed to fully integrate linguistically, culturally and socially. She made a special contribution to the life of the school and the university during this period by raising the profile of Welsh second language students. She came to national prominence in June 2016 by winning the Learner's medal at the Urdd National Eisteddfod under its new guise which placed a new emphasis on the use and application of the language. She was inspired by that experience, and since then she has volunteered on several occasions with the Urdd and has visited several English medium secondary schools to promote the Welsh Language, and to share her inspirational story with many pupils studying Welsh as a second language. During the last academic year – despite the bustle of the final year – she went on to re-establish Cymdeithas Llywelyn, Bangor University’s Welsh Learners’ Society: a remarkable number of 130 students joined during Welcome Week, mostly beginners, and she held informal meetings during the last semester for them to be able to use Welsh socially. Professor Gerwyn Wiliams said: "Today Megan received a first-class degree in Welsh and we congratulate her on this achievement and on her contribution throughout her time as a student here in Bangor." "My experience in Bangor is one to be cherished. I immersed myself into Welsh life by living in the JMJ halls of residence in my first and second year, where the Welsh language is heard everywhere. Not only did I get the opportunity to hear variations of the language and different dialects, there were also plenty of opportunities available to practice my Welsh in events organised by UMCB and the School of Welsh, but in a fun way, and I made friends and got to know more about Welsh culture and life. "I would not have succeeded so well had it not been for the help I received from lecturers at the School of Welsh. They were there to help me with anything, at any time. I was treated as a Welsh Language Student rather than a 'second language' student and I was not separated from the other students, but they also understood how I worked and how to teach me in one-to-one sessions. My favourite memory is of Professor Gerwyn Wiliams attending the Urdd National Eisteddfod to see me winning the Learner’s Medals last year; this demonstrates the Professor’s authenticity, and also reflects the nature of each of the professors at the School of Welsh. "Being a member of UMCB and part of the School of Welsh at Bangor University lifted my spirits and my confidence as a person, and I am very pleased to be able to represent Welsh second-language students. It is a bittersweet feeling to graduate this year with a degree in Welsh. I am so glad that I have been successful and to have had so many unforgettable opportunities during the last three years. Nevertheless, it is the end of a very special period in my life and I will be very sad to leave the university and Bangor, although I will leave with very fond memories. "At the moment, I'm hoping to get a job where I can use Welsh on a daily basis, and I continue to volunteer with the Urdd and I’m gaining new experiences every day. I hope to inspire others and make a difference by changing people's attitudes towards learning the language. But who knows, I’m not prepared to say good bye to Bangor just yet, so I may be back soon to do a Postgraduate course."